I was beyond honored and thrilled to be a part of this important project!!! I teamed up with some amazing artists to record and film this video in support of the arts! Please take a moment to watch this video of "With a Little Help From My Friends" and download the single today! 100% of net proceeds go to Americans for the Arts and their efforts in Arts Advocacy, funding and education and as they fight to protect the National Endowment for the Arts. Read our article on Billboard here! Download the single here or where ever music is sold! If you can't make the concert please consider a donation to his cancer fund by clicking here! Aug 3, 2014 CD Release concert in NY! Interview and performance on Bite Size TV! 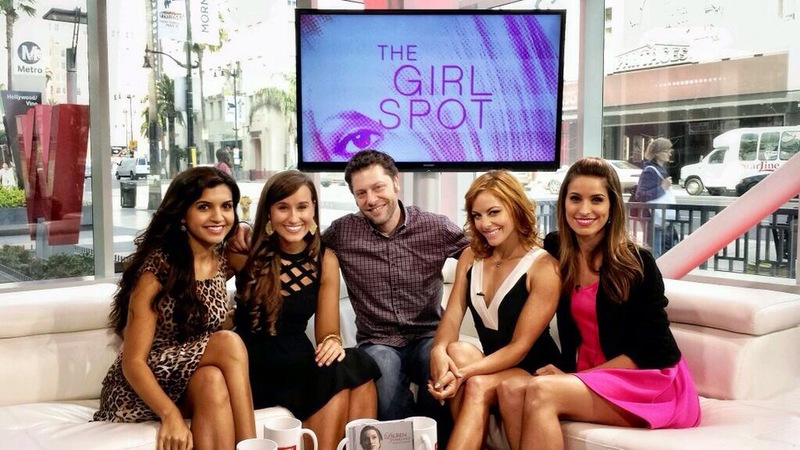 Lauren had a chance to sit down with the lovely ladies of The Girl Spot on BiteSizeTV yesterday! They talked about her new album, Wildest Dreams, the Yanni tour and yes even Adele Dazeem! :) She also did a LIVE in studio performance of the title song on her album, In Your Wildest Dreams and The Prayer! Click on the highlighted links to check it out her performance and see her interview HERE! Lauren is featured on Yanni's new album "Inspirato"
with Placido Domingo, Renee Fleming and more! Some exciting news to share with you all! Lauren is featured on Yanni's new album, Inspirato with opera greats Placido Domingo, Renee Fleming, Rolando Villazon and more! You can pre order the album here! Lauren heading back out on tour with Yanni! Lauren just returned from performing with Yanni in Izamal, Mexico and San Juan, Puerto Rico. Read the review from the Yucatan Times here! Now she's getting ready for the 2 week tour throughout Florida! We may be in a city near you! Check out the Schedule page here to see the dates. You can also purchase tickets through Yanni's website! Lauren featured in the Wall Street Journal! 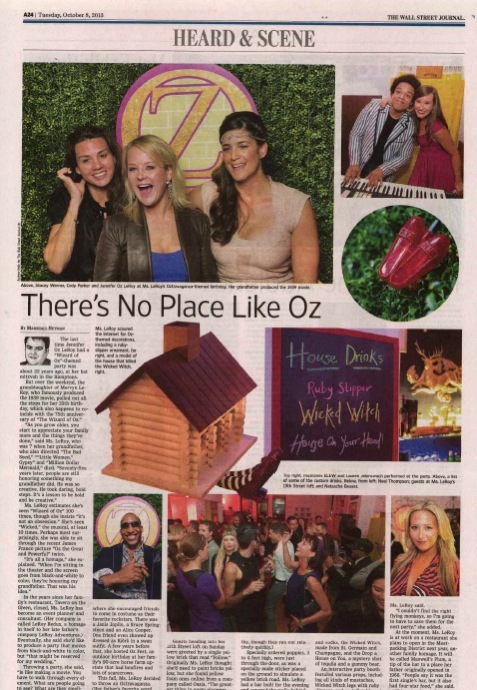 On October 6th, Jenny Oz LeRoy threw a Wizard of Oz themed birthday party at her incredible loft apartment in Manhattan. ELEW, asked if Lauren would be a surprise guest and perform with him to sing "Somewhere Over the Rainbow" for the birthday girl! ELEW came up with a beautiful arrangement of the song. The plan went without a hitch. Jenny was thoroughly surprised and all of her guests had an incredible time! Lauren performing "The Girl in 14 G"
On July 8th, 2013 Lauren and many of Broadways finest gathered together and put on one great benefit for Shakespeare and Co. The evening was produced by Deborah Grausman and had highlights from favorite Broadway musicals and concluded with a VIP reception where Alan Menken (famed composer of many Disney songs) graced us with a group sing-a-long of some of his most beloved tunes. Click Here for the full review and pictures! Peter Breiner put together the most amazing House Concert at his home on May 25th, 2013. He wanted an old European tradition of Hauskonzerte so the esteemed pianist, conductor and composer invited young musicians who he had met by serendipity to perform with him. Lauren met Peter at one of their favorite cafes in New York, Piccolo Cafe. She then realized that her music theory teacher at the Manhattan School of Music had played his album "Beatles Go Baroque" for her class every Friday. The concert was fabulous! See the full list of Bios and the event details here! Performing "Les Oiseaux dans la Charmille" from the Tales of Hoffmann with Peter Breiner.